The Forgotten Highway - at last! 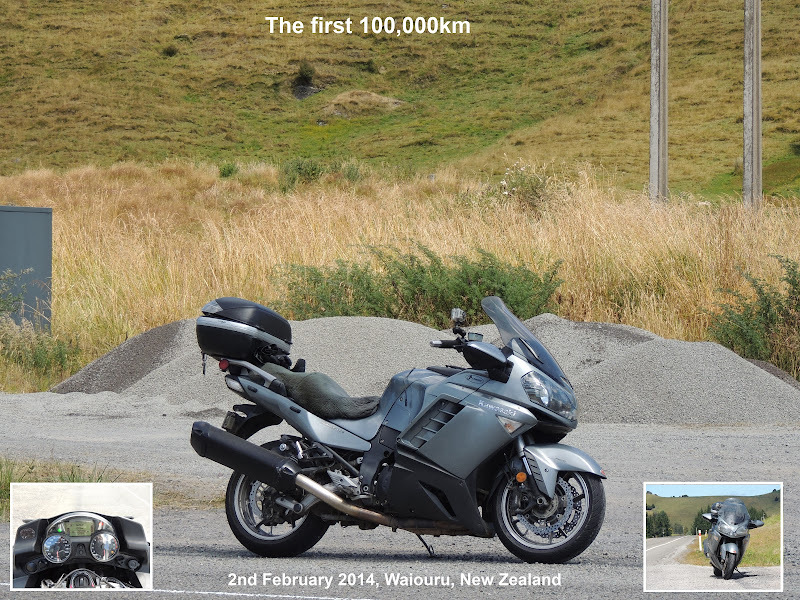 Well after months of careful planning - oops, hang on, I mean a couple of weeks waffling on about it on Kiwi Biker the great day dawned and it was finally time to hit the Forgotten Highway. After getting stuff all sleep I finally got up at just before 6am and after arcing up the 'puter discovered that a few others were up early and chaffing at the bit too. Looking out the window the days was perfect - not a breath of wind and blue skies - yeeha! After brekkie and a fair bit of fluffing around at home, Mark finally turned up and it was time to head off and meet up with the rest of the Palmy (and Ashhurst) crew. We got down to the garage at about 07:30 and were not the only ones early tanking up bikes and bellies (bunch of pie eaters!) By the time we were ready to go there were eleven of us (only two Concours's/Concourses/Concoursi) and we got away a little after 8. I ended up leading us off as Cowboyz bike has become a bit of a cop magnet lately and he was not keen to have to talk to another cop so early in the ride - I did notice however that he was quite happy to hide from the radar by tucking in behind me. Anyway, we had a quiet little early morning ride over to Wanganui (only one cop in the end) where we pulled up to meet Hornet250Boy on his new bike (not a Hornet). From there it was about another hour's ride to Stratford and our first fuel/drink stop. 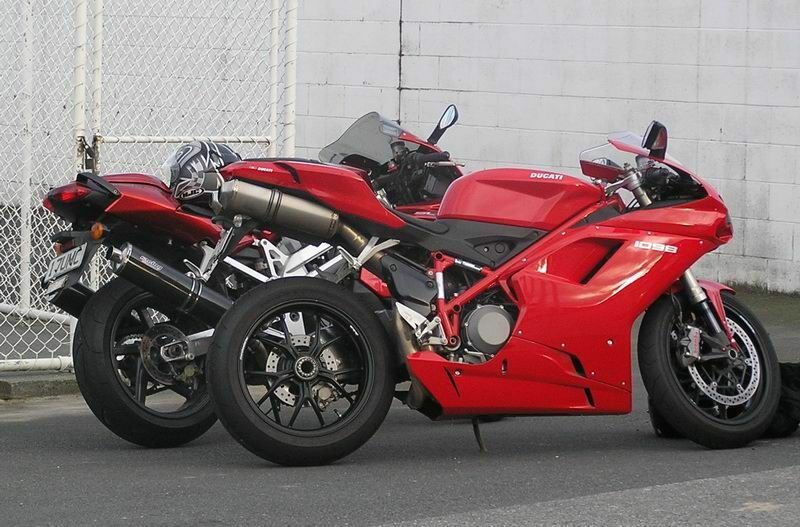 In Stratford we meet up with another 9 bikes all rearing to go and hit the highway. Being locals they led the way and we were soon into some fantastic fast but windy roads. Our first stop on the Highway was at the top of the first saddle (forgotten it's name) where everyone quickly had their cameras out taking pictures of the great scenery and all the fine machinery out enjoying the day. After the photo op we all re-mounted and headed off on roads that were just fun with a capital F! It was about now that the temperature was really getting hot and by the time we stopped at Whangamomona for our lunch break there were a few tongues hanging out. The only unfortunate incident was Bonez having a wee off on his mighty GB. Luckily he didn't knock himself around too much and he soon had his steed knocked into shape for the rest of the ride. At Whangamomona a couple of 'naki riders had been good enough to come through in their car (poor them) and set up a barbecue lunch for us. They more than looked after us and everyone really appreciated the effort they put in to feed the tribe. While we had our lengthy lunch break quite a few other bikes went through so we weren't the only ones out enjoying the road and great conditions. It was here also that we discovered a another nasty - Sarah's old Honda had lost it's rear brake. Something pretty disastrous had happened and there was brake fluid leaking out all over the place. No bike shops on the FH so she was going to have to battle on without the rear brake. On the road again and we finally hit the unsealed section of the road. Luckily it was in very good if dusty condition and wasn't really an issue at all. Soon we were off this and back onto good old tar seal - or did I speak too soon? By now it was around 1:30 or so and the sun was really working overtime - the roads were getting really hot and the tar really slippery. After a couple of slithers I backed off a bit and settled into a cruise keeping by eyes (and nose) peeled for the shiny stuff. When we eventually came to the end of the FH and into Tamarunui we pulled up outside a bike shop and I discovered that Mark wasn't with us. 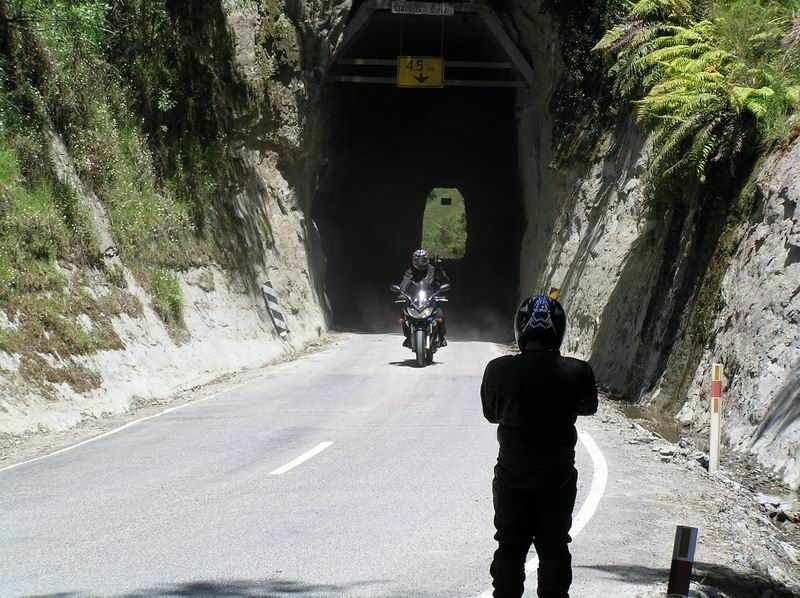 He had been at the front when we left the tunnel so I figured he had gone onto Turangi which was our next pitstop. I took off after him and had a real blast heading over the hill on Highway 41 to Turangi. Just had to watch the hot tar in places again. 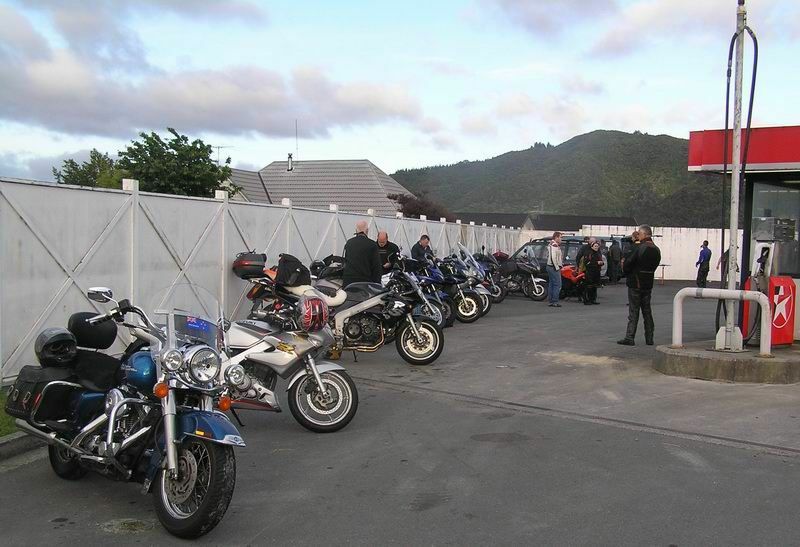 By the time I got into Turangi Mark was filling up his bike and wondering where everyone had got to. I gassed up, grabbed a drink and we parked up and waited for the rest of the crew. They had taken there time and headed up to a look-out which gives good views of Turangi and the lake (been there, done that). They'd also said their goodbyes to the 'naki boys who had headed home from Tamarunui. After everyone had gassed and watered we headed off down Highway 1 and onto the desert road. There was quite a bit of traffic on the road (Sunday arvo - everyone heading home after a weekend away) and we were unfortuante enough to get stuck behind a HP car just north of Waiouru. Another quick stop in Taihape before the final leg home over the Vinegar Hill. A bit of steam let off there before saying seeya to the guys and running for home. A great day's ride in near perfect conditions and another pin in the map - great to find a road you haven't ridden before and then cross it off as done! Will not be the last time I visit Whangamomona and the Forgotten Highway! Some more (limited) info here. Wonder if it'll come to NZ? I've had a play with the map & worked out some rough distances so as to plan fuel stops etc. Have assumed everyone can manage 200kms on a tank. Awake early to a nice sunny day! Palmy crew meet at BP Rangatiki @ 07:50 for 08:00 start. Arrive Stratford somewhere around 10:30 (maybe a tad earlier). Head on to Tamarunui then Turangi for gas. Quick stop at Flat Hills or Mangaweka for a coffee. Have fun but take it easy - don't want any mishaps! Careful on the gravel - no roosting! If you want to stop for photos anywhere on the Forgotten Highway go for it - you won't be the only one. That's enough of that waffle, see you there! Sign up to join us here. Yep, the weather over last weekend was far too nice to leave the bike locked away in the shed. Mark & Shelley were in Napier visiting Mark's parents and Mark had mentioned to me that he'd give me a ring before he left Napier so I could come up and meet them somewhere for a bit of a ride. The trouble was waiting around for the phone call. By 11am I had done most of the things I wanted to do around home and ended up deciding not to waste any more of the nice day. I gave Mark a quick ring and said that I was on my way, geared up and hit the road. I took my time heading up highway 2 and stopped in Waipuk for some gas and a quick bite. I managed to squeeze 21 litres into the tank but for that amount of fuel I had travelled 368km - the furthest I've pushed the Concours yet. 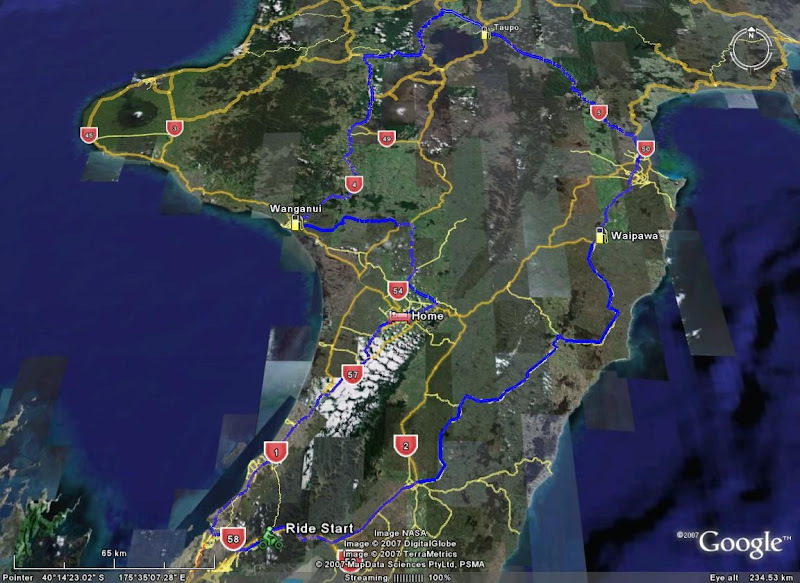 I turned off Highway 2 at Waipawa and headed through to Patangata and then onto Middle Road into Havelock. A great bit of road this and I was not the only bike out having a play in the sunshine - there was a whole group of riders stopped at Patangata for lunch and a few more went past me going the other way. After a quick stop in Haumoana to pick up Mark & Shelley we headed out through Hastings and then off down Highway 50 for home. Once again we were not the only bikes out and about and we saw quite a few heading North. Back on Highway 2 and we cruised back to Palmy with good weather all the way. Nice to see a bit of sunshine - hope it holds for the ride this weekend and the Forgotten Highway ride. 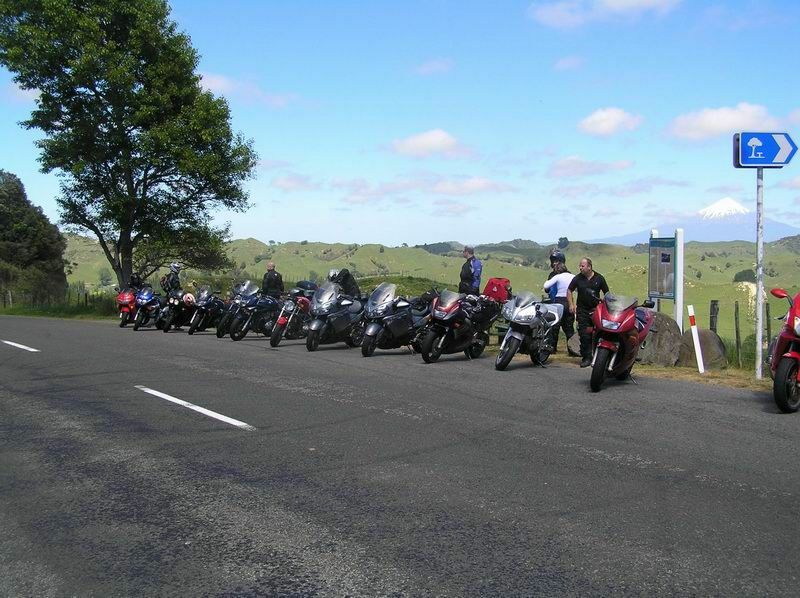 The Woodville Lions Coast to Coast is on again. Proceeds go to the local rescue helicopter. Usually brings out a few riders - some idiots as wells so watch out for them. Date is the 8th of December with kick off is at 10:30am from Himatangi Beach. Seeya there. Check out the below link for a very quick look at the new GSX650F. Probably quite a nice little bike (both Mark & I had 750's) but the very first comment to the article raises a question that I've always had: why don't Suzuki build a GSX1250F or GSX1400F? They've got some great motors etc but aren't putting them in anything that is truly designed for touring. Don't get me wrong - I toured big time on 2 Bandits and they did the job but what about better weather protection, standard luggage, a shaft and some other touring goodies. All the other Japanese manufacturers can do it and Suzuki did it in the past so what's the excuse? Changed the front tyre on the Concours today. The standard Battleax only lasted 6,500kms - not too good really. As the rear is still looking pretty good I fitted an old Metzler that had come off the Bandit and I'm hoping it will at least last me until the rear is ready to be changed - that way I can by a matched pair. I've also ordered the Givi top plate & mounting brackets so that I can use my V46 on the bike. 10-12 weeks delivery! Really hope it comes in before the Mini's Return. Will be good to have the extra versatility of the top box. After all the great rides I've been on lately I thought that it was time to share another hard ride. 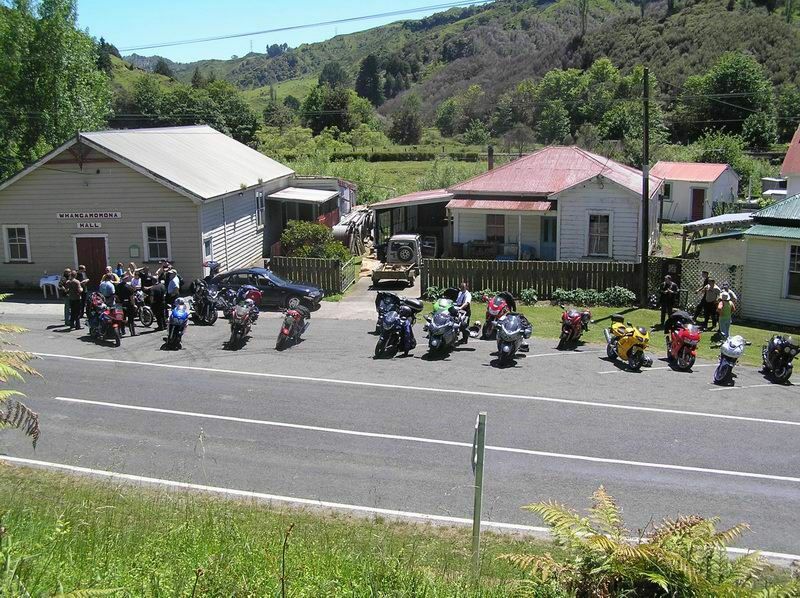 This one was a couple of years ago and the hard part occurred when coming home from a toy run in Wanganui. I'd arrived early in Wanganui in fine weather but before we were due to head off it started raining. So before the ride left I put on my wet weather gear and stashed my camera in it's little bag (not waterproof) then inside the bum bag (waterproof?) my wet weather comes in and finally in my back pack. The ride headed off in damp conditions and wound it's way via back roads to Marton where it stopped so riders could take a break and have a drink etc. Looking at the weather I decided to carry on home to Palmy so I didn't get drowned. Yeah right. It got so bad that I had to pull over because I could not see and thought I was going to get blown/washed off the road. Cars & trucks also started pulling over - no visibility, just rain. I still don't know how I stayed on the bike - when I pulled up my front wheel ran into some quite deep metal but somehow I stayed on. It was that windy that I could not take my left foot off the ground to put the bike in neutral - I just flicked the kill switch. It was a struggle just staying vertical - the bike was being blown around even with both my feet on the ground and me hanging on for dear life. By now and in the space of a couple of minutes the water had got completely through my wet weather gear and riding jacket and pants. It had even got through my visor (slightly cracked open to stop fogging up) and got my glasses wet. After a while the rain seemed to ease up so I hit the starter and attempted to roll on down the road (with glasses in pocket). I got about 10m and had to pull over again - still too wild. I tried again in a few minutes but still the same - at least I was able to pull over into a larger area where the trucks couldn't get me. After a while the rain stopped completely and the sun actually came out and as I was starting to feel a bit cool I decided to break for home. Turning the corner into the main street of Bulls it was amazing to see how much water was on the ground. The only place where there was no standing water was the centre of the road but this was no place to be if you wanted to avoid being splattered by a truck so I ended up weaving in and out of the water until finally out of the flooding. I was also not the only idiot on a bike out in it - I saw another guy on a Blackbird doing exactly what I was doing. And what makes things worse - I never even got a badge for the ride, they'd sold out before I could get one! BTW: the water got through my pack, the bum bag and the camera bag was starting to absorb water prior to transferring it to the camera! The camera looked ok but I chucked it in the hot water cupboard anyway and it still lives! 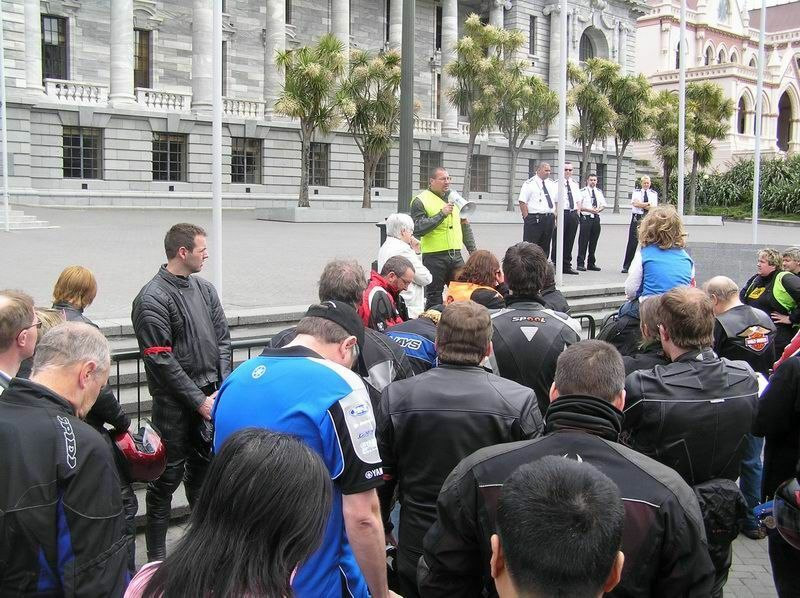 As a result of a horrific accident in Auckland where a young biker was killed after crashing and hitting a Wire rope barrier the NZ biker community (particularly on the Kiwi Biker website) has been pretty vocal in their condemning of the wire "cheesecutter" barriers and a number of protest rides have been organised. Today was Wellington's turn and so I had to be there. Mark & Shelly were keen and I managed to talk Brian into stealing his brother's bike and bringing Linda down for the ride too. I left home pretty early and went around to pick up Brian & Linda and we then headed off down to meet up with Mark & Shelly on the Opiki road. on the way down we saw quite a few bikes heading out and about but unfortunately not in the same direction - to the protest. After a quick gas up & drink in Otaki we continued on down towards Plimmerton where one of the two groups of riders was to depart from. We caught a few spits and eventually some fairly decent rain before finally pulling up outside the Sandbar. Here we signed the petition, put on some red armbands and chatted with a few of the assembled bikers (hi Chancey/NZSarge)while we waited for the rest of the riders to arrive and the rain to stop. Just before 11 we were given our briefing and we mounted up to head into town. The lead riders took us slowly on up the highway and we got another drenching but all the riders behaved themselves and formed up behind the leaders well. It looked quite impressive in the mirrors! 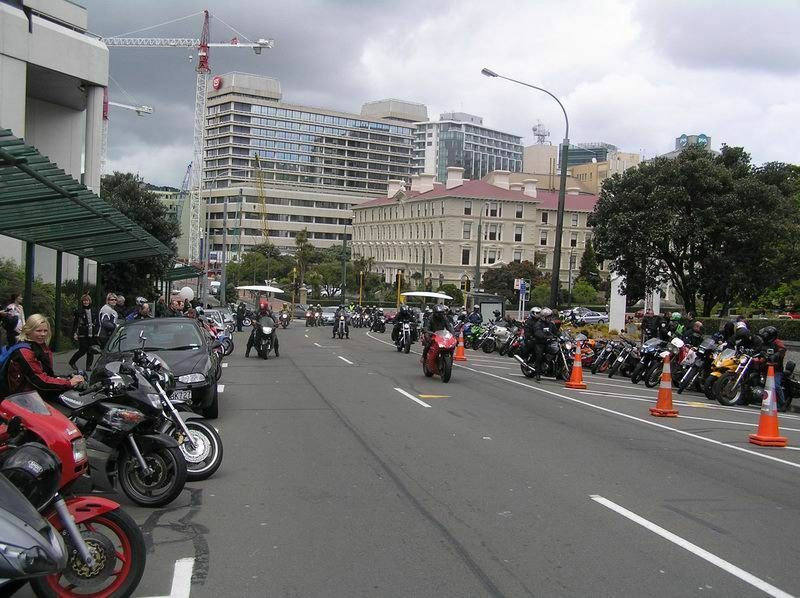 When we got into Wellington we hooked up with the other group of riders and made our way to park up outside the parliament buildings before heading into the parliament grounds for the speeches. First up was "Colapop" who had done a lot of the organising for the ride and he spoke very well about why we were there and what we were hoping to achieve - a top guy. Secondly we had Marian Hobbs explaining how our petition might help us get a voice at any select committee looking into road safety etc. Lastly, another Kiwi Biker who's name escapes me read quite a long speech but was once again very well spoken and made some very good points. 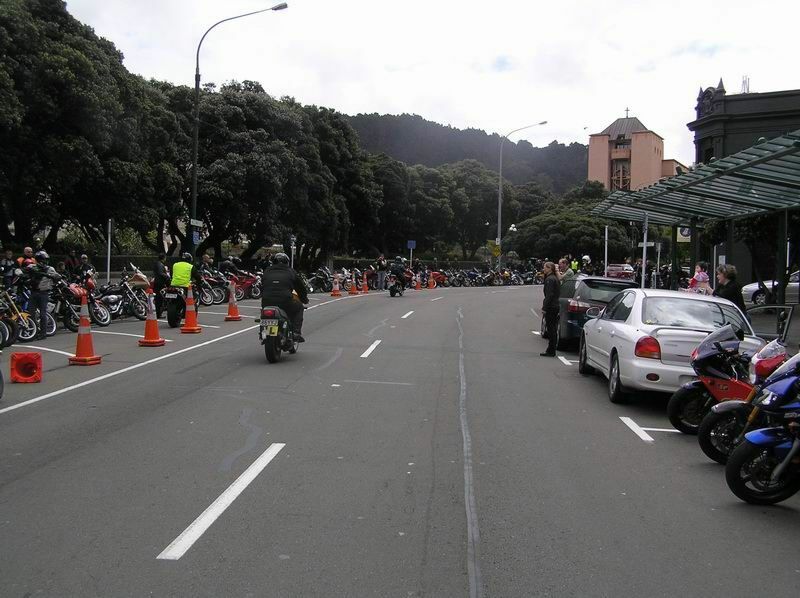 All up the organisers think that around 200 bikers turned up with some coming from the Hawkes Bay and Wanganui. After the speeches etc we tootled into town for some lunch before heading home into weather that just kept getting better. More of my pics here. Other Kiwi Bikers' pictures here. And the Cheesecutter website here. The alarm going off at 4:25am on a Saturday morning is not normally a cause for any sort of celebration but when it means the chance for a decent ride on great roads then I guess I can put up with it every once and a while. The Ride in question was the Capital 1000K Cruise being organised by KoroJ a fellow GC riding nutter and was looking like a real beauty - lots of great roads, all of which I'd ridden previously so no worries about getting lost. After the early wake-up I quickly scoffed by weeties and jumped on the bike to meet up with Mark on the Opiki road. Off into the cool darkness went the mighty kwaka and soon I arrived at the meeting point where Mark was just pulling up - pretty good timing. I buttoned off for just a sec to let Mark catch up and we then enjoyed a nice ride on empty roads all they way down past Shannon & Levin and then onto the main road. Traffic was still pretty light and it's always nice riding at this time of the morning - watching the sun slowly start to rise and reveal what sort of day lies ahead. We turned off the main road and headed over the Haywards into the Hutt. Took a bit of scenic ride through Upper Hutt to find the Caltex station when we could have actually ridden up the motorway - doh, we'll know for next time. We pulled into the station at about 6:30 and topped up our tanks before parking up and catching with KoroJ and some of the other riders. After a quick briefing we were cut loose and everyone headed for their bike and out onto the road. First up, a quick ride over the Rimutakas where a few cars and one Harley rider were dispatched before heading on up the road to Masterton. 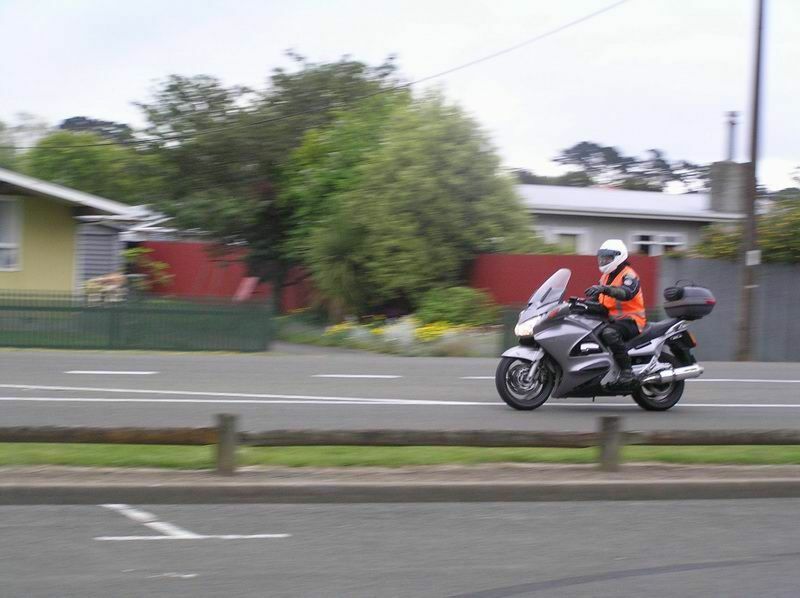 By the time we got to Masterton the Harley rider and a few others had formed up behind us and I thought there was going to be a bit of a convoy up through Highway 52. But it wasn't to be, they all stopped for gas as Mark and I turned off. KoroJ must be learning a thing or to about organising rides off the Rusty Nuts crew as he sent us out onto highway 52 all the way through to Waipuk which is a pretty quiet back country road that requires a lot of care and really drops that average speed. Never the less it is a good ride with some quite good scenery. But you need to keep an eye on the road: the road is in bad condition in a lot of places and you need to treat any corner with a bit of respect - you never know what the surface may be like or if there will be stock on the road. I thought that we'd be cleaned up by some of the faster g uys through here but in the end only 2 guys got past: a Honda Transalp and a Duke 1098, both passing where their bikes shine, the Transalp on some dodgy surfaces and the Duke where the road had opened up to some faster, smoother corners. Another older guy on an ST1300 formed up behind and sat behind us for a while before finally dropping back for some reason. 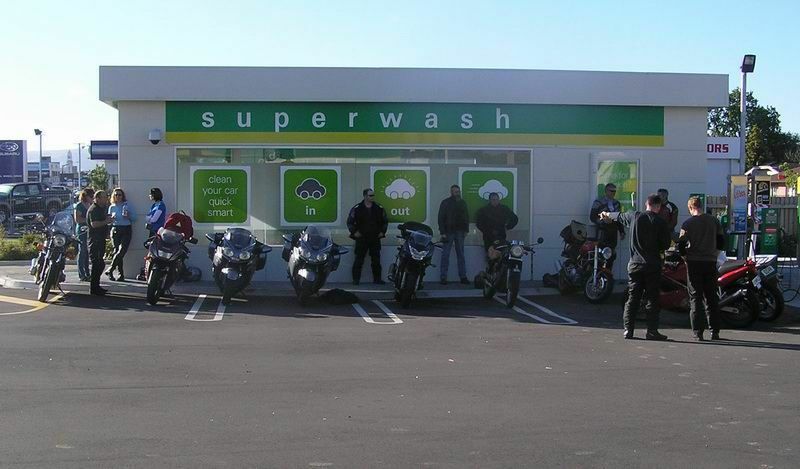 We were both quite keen to hit the gas station at Waipawa where both bikes and riders needed a pit stop. The day was turning really warm so a few layers were removed before heading on up Highway 2. We made really good time through here and all the way to Taupo. The Taupo road was it's usual fun ride, I just hope the guy in the Blue mitsi van didn't get my photo! 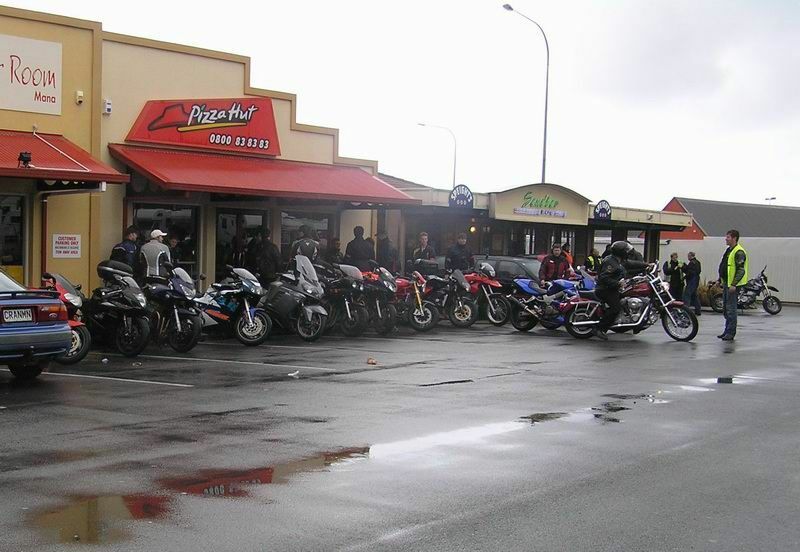 We hit Taupo at about half past lunch time so we gassed the bikes and then stopped at the subway for a bite. The 1098 was there and just leaving as we stopped - a quick chat and he was off. While having lunch a few other guys went through and we never saw them again. As we were leaving the Harley guy turned up - seems all the riders were giving the subway some business. The plan now was to head out of Taupo and over Poihipi road which then links up with the Western Access and then up over 41 to Tamarunui before heading south to National Park and our next stop for gas at Raetahi. We had a great ride (as usual) around the back of the lake and over 41 before hitting the slightly boring road to National Park. 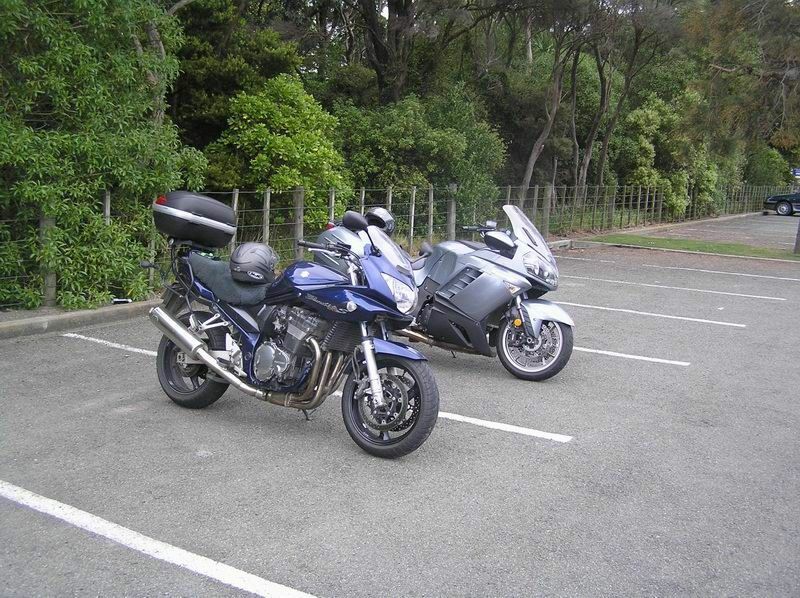 At Raetihi we abandoned our plans to gas up as both bikes had been sipping (read cruising at nearly legal speeds) and waved to the 1098 rider who was taking a bit of a breather before heading for the Paraparas. The Paraparas weren't in too bad nick and with mostly dry roads (the odd damp patch but only spits on the visor) we had an enjoyable ride into Wanganui. As we now did need gas we abandoned Koro's route (will have to try it one day though as it cut's out Wanganui quite nicely) and headed for the nearest gas station. As we were getting ready to leave a few more guys turned up along with the guy on the ST. He was a bit unsure of the turn-off to take him to Fordell so we gave him some quick directions before leaving. We sat around - actually stood around, we'd had enough sitting down for a while - and eventually the ST turned up (see piccy above) and we waved him off. Cowboyz had spotted us parked up and came for a quick chat while we waited. We saw another couple of bikes go through but didn't recognise them and in the end we headed off home. Yep, only just back from the 2007 Grand Challenge and with the Mini's Return and another GC to do but the Rusty's have let slip about the 2009 Southern Cross. Yep, made it into Two Wheels again! Piccy taken at the lookout half way up Coronet Peak, Queenstown on the way home from the 2007 Southern Cross.